Large pores aren’t the easiest look to rock, even though it’s a natural condition of the skin. 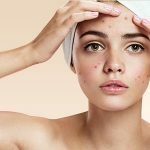 While there are many ways to treat and reduce the appearance of large pores, genetics can be usually blamed for their existence. That’s right, it’s an inheritance most family members won’t want for themselves! Oily skin tends to be a common partner of large pores. While oil keeps the skin moisturized and protected, it flows through the pores that widen and narrow. When we get hot, our pores widen to release sweat and oil. When excess oil builds up in the pore, along with dead skin cells and oxidized sebum, it becomes noticeable and unflattering. Large pores can be treated in a variety of ways. Adjusting your habits is a great first step toward smooth, clear skin. Washing your face in the evenings with a cleanser will help to maintain skin turnover, keeping you fresh and clean. A gentle exfoliant can be used once per week to remove oil, dead skin, and other build-up. Make sure to use warm water or even steam to soften and prepare your skin before washing and scrubbing. Finish your routine by protecting your face. Using a moisturizer that is specifically geared toward your skin type (oily, dry, combination, acne-prone, etc.) can make a huge difference. Another tip is to think about what touches your face. Make sure to change your pillowcase regularly so you’re not exposing your skin to bacteria and debris from previous nights of beauty sleep. When taking calls, switch to speaker-mode so you don’t have to press your phone against your cheek. For longer-term improvement and more noticeable results, laser treatment is the way to go. PicoWay Resolve is an ideal option for those who want to make a more permanent change. Choose this method if you want beautiful skin with noticeably smaller pores. PicoWay Resolve is a laser treatment that can reduce the appearance of large pores quite dramatically. The name PicoWay comes from hyper-short laser pulses called “picoseconds,” while PicoWay Resolve multiplies those laser beams into 100 “beamlets” to stimulate the growth of new collagen and elastin proteins. In other words, skin is strengthened and enriched. Goodbye large pores, hello sleek cheeks! A major advantage to PicoWay Resolve is that it reaches beneath the skin’s surface (also known as sub-surface ablation). For the person undergoing treatment, this means a safer process with fewer side-effects, as well as minimal recovery time between sessions. Avoid less advanced methods of skin treatment that cause unwanted side effects including pain, burning and more scarring — yikes! PicoWay is the safest and most effective way to go. Each PicoWay session takes 15-20 minutes. Some results may be visible after a single treatment but generally, 3 sessions will show significant improvement. Fortunately, minimal downtime is required after your appointment — you can expect to book your next session 4 weeks later. PicoWay Resolve is a treatment you can trust because it’s been scientifically proven to reduce the appearance of large pores. While there may be some redness and tingling immediately after the laser session, most users have reported little to no discomfort. Your PicoWay provider can provide before and after-care instructions to make your treatment go as smoothly as possible. Large, visible pores don’t have to define your look. You deserve skin that reflects your inner beauty, so don’t hesitate to visit Advanced Laser Clinic. Put your best face forward! Are Your Tattoos Hurting Your Job Prospects?